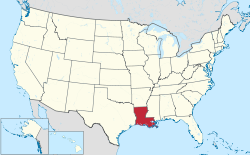 State song(s): ""Give Me Louisiana"
Louisiana (pronounced /lōō-ē'zē-ăn'ə/) is a state in the Southern United States of America. It had a population of about 4,533,372 people in 2010. The state has a total area of about 51,885 sq mi (134,382 km2). Louisiana is the 25th largest state by population and the 31th largest state by area. Louisiana is also known by its nickname, The Pelican State. The land that would become Louisiana was bought in the Louisiana Purchase in 1803. 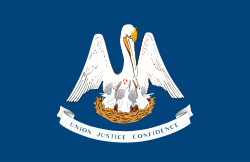 Louisiana became a state on April 30, 1812. It was the 18th state to become part of the United States. The people who live in the state are known as Louisianans. The state's capital is Baton Rouge, and its largest city is New Orleans. Louisiana has coastal plains, marshs, and low ridges. All of the state is in the Sun Belt. Louisiana is in a sub tropical region, and has a diverse ecosystem. The climate of Louisiana Louisiana has a humid subtropical climate (Köppen climate classification Cfa). It has long, hot, humid summers and short, mild winters. One third of the adults in Louisiana are obese. This is the highest rate in the United States. Louisiana was settled by France and the influence of French culture is still a big part of Louisiana today. The French Quarter in New Orleans is one of the best known attractions in the state. It is known today for its special culture, unique food, as well as the holiday Mardi Gras which is most famous in New Orleans. Louisiana was very badly damaged by Hurricane Katrina in 2005. Much of the New Orleans area lies below sea level making flooding a serious problem. 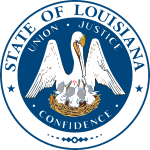 Wikimedia Commons has media related to Louisiana. ↑ "United States". Modern Language Association. Retrieved June 14, 2017. ↑ "Expert: N.O. population at 273,000". WWL-TV. August 7, 2007. Archived from the original on September 26, 2007. Retrieved August 14, 2007. ↑ "Relocation". Baton rouge. Connecting U.S. Cities. May 3, 2007. Archived from the original on February 9, 2014. ↑ "Louisiana: Population estimates". U.S. Census Bureau. July 1, 2017. Retrieved May 6, 2017. ↑ 7.0 7.1 "Elevations and Distances in the United States". United States Geological Survey. 2001. Archived from the original on October 15, 2011. Retrieved October 21, 2011. ↑ The Tormont Webster's Illustrated Encyclopedic Dictionary. United States of America: Tormont Publications Inc. 1990. p. 998. ISBN 2921171325. Retrieved February 26, 2011. This page was last changed on 25 January 2019, at 21:44.